Scripture selection is Day 6 Period I.
for March 10th are Luminous. R. Stop and have a moment with Jesus. Like seeing your good friend. Jesus loves us so much. 1. I, the Lord, am your God. You shall not have other gods besides me. We give our love to God. God loves us so very much. serve Him and to know Him. us, Body, Blood, Soul and Divinity. relationship with you My beloved. Jesus: Live in My love. all day, pray this prayer. moment you are one with Me. letters of love in God's Blue Books. 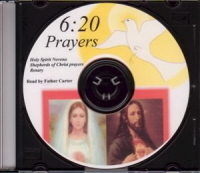 Jesus: Pray the Holy Spirit Novena I gave you. 2. R. And so, He sat on a mock throne and they spit on our King, the King of heaven and earth, Jesus. They spit on the King and they mocked Him, and they pounded into His head the thorns that they had crowned Him with and they laughed. Isn’t it awful? Yesterday, I felt like this: I went to pick up my son at school and I saw two people in the car. And I was having trouble getting into this spot and I was backing in and coming out and backing in and coming out and I just couldn’t get the car in there. And they were in their car and they were laughing and laughing and I felt like they were laughing at me. But they may not have been laughing at me. But anyway, just that little thing it just made me feel like - I don’t like people laughing at me. You know what I mean? It just doesn’t feel good. Well think of God, the Almighty God - God - and they are spitting on Him, pounding on His head. They’ve whipped Him, mercilessly, and now they were standing around and mocking Him and laughing at Him. 4. R. This is part of Fr. Carter’s Newsletter: “To Live in Christ Jesus”. This is a quote from John 10:11-15. 5. R. Is this not the message that He gives to us? Jesus said that this Church had the Father’s thumbprint on it. Do you notice the mural and how it’s shaped as a thumb on the top? Yes, the Good Shepherd has laid down His life for us. Through His life, His brutal and agonizing suffering and death on the cross, and His glorious resurrection, He has achieved new life for us. We truly live a new life in Jesus: “You have been taught that when we were baptized in Christ Jesus we were baptized in His death; in other words, when we were baptized we went into the tomb with Him and joined Him in death, so that as Christ was raised from the dead by the Father’s glory, we too might live a new life.” (Rom 6:3-4). And again Paul speaks to us: “...wherever we may be, we carry with us in our body the death of Jesus, so that the life of Jesus, too, may always be seen in our body.” (2 Cor 4:10). 8. 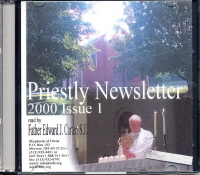 R. This newsletter will majorly help to renew the Church and the world, as priests read this and consecrate their hearts to the Hearts of Jesus and Mary and hear Jesus teach, teach through Fr. Carter’s writing. Listen to My Words of love. great gifts to lift you up. still singing, but they do not hear. 6. R. And we will know truly someday that all that He gives to us is the truth. For He wants to be worshipped and loved and adored by the people. It will be an earth in which God will be their God and they will be His people and each one of you present here He has called to help to bring about this new earth. Though small in number it does not matter when the Might of God is behind us. And when we dwell in His Heart, He acts, in us, in this world. 7. Jesus: You will be taunted and pressed on. You will want to run away and you will want to give up. You must remain in Me to the bitter end. For it is in the end that it will be your endurance that will make the difference to so many souls. At this time you are being tried and tested and you are being taught, My beloved ones, for this is your testing ground. This is the stage that I have set to teach you the lessons that you will need to know to help to bring My Light to the darkness. Do not be afraid for I walk with you. As I walked on this earth, I walk with you this day in your every breath and your every heartbeat. I am so intimately united to you. You must open up your heart and let Me live in you. R. Through Him, with Him and in Him in the unity of the Holy Spirit, we are one in Him with the Almighty God: Father, Son and Holy Spirit, that live and dwell within us, when we are in the state of grace. 8. R. And they worshipped the molten calf. There were so many things that they had for their gods and they thought that the Lord had turned His head the other way. But His head was straight up and down when I saw it on the crucifix. I saw His head straight. His head on the crucifixes are turned toward His shoulder but He sees all the deeds that men perform and He knows and reads their hearts and nothing will go unnoticed. For He is the Almighty God, a just God that will pay all rightfully according to their deeds. And He gives to us a great treasure and He gives to us a sharing in His Divine life and the treasure that He gives is treated with great indifference by these men, the creatures of this earth. For they worshipped a molten calf. But the secret is this word. Men will have the light and will know Him when they give their hearts to Mary’s heart. Mary is the woman clothed with the sun, adorned in light and Mary will take her children into this age of light. As we meditate on the mysteries of the rosary, we must focus on the lives of Jesus and Mary alive in our life today. When we read the Scriptures today the Word of God is living in us. Where as before we may have experienced it with much difficulty. It is alive in our hearts. We are fed with His Word. Jesus: So when you are taunted and you are pressed on, My beloved ones, go to My Word and read the Word of God and I will refresh you and bring you light. 9. R. For the Word of God was very difficult for me to comprehend before. It has become my very life. 10. R. I opened its pages and felt like a blind man staring at the page. Today, I open the pages and it is alive in my heart. R. And God gave Himself to us on the cross and He hung there with the good thief and the bad thief. And there was a tree, the tree of good and evil. And this is how it is today in our life. At every moment there is a moment in which we can do the will of God or we can do a willful act of our own choosing against His will. For at every second we choose as if picking fruit off the tree between the good fruit and the bad fruit. And this second, and this moment, what will be the Will of God for me? Jesus: But it is today, My beloved ones, that you will be pressed on by satan and it is in My grace you will be able to withstand the torture that he gives to you. You must come to the tabernacle. You must pray as frequently as possible. For you will be tested and tried and you will want to cry out and scream but you must not, not run away. If you lose your patience, you must come to Me. You must say that you are sorry. You must love and work with one another. You are My people, My little family. If you do not love, who will I send? You are My family. Who is My brother? Who is My Mother? Anyone who does the will of the Father. R. We are brothers and sisters. We are brothers of Christ. R. Eve was taken from the side of the Adam and the sacramental life of the Church was born from the side of Christ as He hung on the cross. At other times it is not so much selfishness which leads us to say no to God, it is rather fear. We hear God’s voice calling us higher. We hear His voice asking something which seems very difficult. We hear His voice asking something we had not at all expected. Yes, we hear all this-and we draw back. We draw back because we are afraid. We refuse God because our fear focuses our attention on what we are rather than on what God is. We look too much at our own weakness, rather than at God’s power which can transform our inadequacy into a mighty strength. In all this Mary offers an example. Selfishness was totally foreign to her. She did not belong to herself. She belonged to God. She was not closed in upon herself. She was completely open to God. When God spoke, she listened. When God pointed the way, she followed. She realized that life is not a process a person masters by carefully mapping out one’s own self-conceived plans of conquest, but a mystery to be graduallyexperienced by being open to God’s personal and loving guidance. Selfishness, then, did not close Mary off from God’s call. Neither did fear. God asked her to assume a tremendous responsibility. He asked her to be the Mother of Jesus. Mary did not engage in a process of false humility and say that such a great role was above her. She did not say that she did not have the proper qualifications for this awesome mission. Briefly, she did not waste time looking at herself, making pleas that she was not worthy, telling the angel he had better go look for someone else. No, Mary did not look at herself. Her gaze was absorbed in God. She fully realized that whatever God asked of her, His grace would accomplish. She fully realized that although she herself had to cooperate, this work was much more God’s than hers. Mary’s words, then, truly sum up what is the authentic Christian response at any point of life, in any kind of situation: “I am the handmaid of the Lord,” said Mary, “let what you have said be done to me”. • People are Looking at Us. “You are the light of the world. A city built on a hill-top cannot be hidden. No one lights a lamp to put it under a tub; they put it on the lampstand where it shines for everyone in the house. In the same way your light must shine in the sight of men, so that, seeing your good works, they may give the praise to your Father in heaven” (Mt 5:14-16). Jesus taught by word and action. He talked to huge crowds, to small groups, to various individuals. He talked about love and friendship, about joy and suffering, about life and death. He had a message to spread, His Father’s message, and He did not miss His opportunities. It was not enough for Him merely to talk about His Father’s message. He was also constantly teaching by the total event of His life, death and resurrection. Not only His words, but also His actions spoke out loud and clear. He not only talked about the love we should have for one another. He incarnated this teaching in the laying down of His own life for the salvation of all. His words spoke eloquently of brotherly love. So also did His bloody and bruised body nailed to a cross. His words sounded so convincing. The way He went about living could also pierce the hardest heart. Jesus invites us to assist Him in the continuation of His teaching mission. The method of procedure remains the same; we, too, like Jesus before us, are to teach by both word and action. The opportunities for teaching by word are more numerous than we might expect. For it is not only bishops and priests and teachers of religious studies who teach by word. Parents, as they rear their children, have numerous opportunities to teach Jesus’ message. Friends talk about all sorts of things. If one is sincerely Christian, his or her friend will eventually know. The opportunities to teach about Jesus by the way we act are even more numerous than are the occasions for variously speaking about the message of Jesus. People are looking at us. We cannot long hide the life-vision which thrusts us forward, which motivates so much of what we do. If we live according to the pleasure principle, this becomes evident. If we live according to the money principle, this also becomes manifest. If we are close followers and friends of Jesus, this too becomes clear to people. They will know by the way we work and play, by our attitude towards life and death, by our refusing to become bitter despite even great suffering, by the way we treat others, especially those who are poor, or ridiculed, or discriminated against, or passed over as unimportant and of little worth. If we are deeply Christian, Christ’s way of thinking and doing will necessarily affect our own way of thinking and doing. 5. Jesus: I am the Good Shepherd and I give to you, My beloved ones, My beloved apostles, the command to pray for My priests. The prayers of ye holy souls will reach the Almighty God and He will answer them. Your holiness is not measured by the trials that you are experiencing. Your holiness is measured in your desire to continue to endure, to love God above all things, to help to bring about His Kingdom, for you will suffer far beyond any of your expectations on your way to help to bring souls to Me. For the devil will press and press on you. He will try you as never before and you will argue and you will fall to your knees and you will see your imperfections parade in front of your face. And if you run because you are not perfect, this world will suffer. You must come to the tabernacle everyday and spend this time with Me. If it is impossible, you must spend the time alone with Me. You will be tried far beyond any trials that you have experienced. You will argue with one another for satan will attempt to divide you and tear you apart at the seams. If you run away, who will I send? You are not perfect. You are imperfect instruments that I use, that I love dearly. You must be humble. You must admit your faults. You must be loving above all things for I will show you that you are dependent on Me. It is in grace that you will grow in holiness. You cannot be proud, for the proud heart will stay proud and will not become holy. The holy man, is the man, who admits his faults, who goes to confession, who above all things loves God and wants to do the will of the Father. Thy Kingdom come, Thy will be done, on earth, as it is in Heaven. What will happen if you say no? 6. Jesus: For they were a willful race and they were rooted in pride and when they sinned, they covered up the sin and they hid the darkness within. My beloved ones, you are the ones that will wear the white robes. When you soil the garments that you wear, you come to the priests and you ask for forgiveness. For it is in purity, that you will unite to the Bridegroom of your soul. The more you pray with a pure heart, the more your prayers will weigh heavy in Heaven. Every moment it is important that you strive for purity. And as you try more and more to be pure, satan will attack you vehemently, to try to get you to sin, for your prayers are, mighty prayers, that come to the Almighty God and satan wants you to sin, for he does not want your prayers to be heard. You will be attacked, vehemently, by satan. He will try to get you to sin. You must keep your garments white and pure, washed in the Blood of the Lamb. And above all, the order must be, that of: love, your hearts rooted in love and humility, as you lead the world to the light, and to My love alive within you. 7. R. We are fed by the Word of God. It is the living Word, the living Word. And so we read the Word of God and it truly lives within our being. Deeper and deeper the words penetrate within our being. The Word is spoken many times in the Church today with lips that are hollow, that do not experience the Word, in their hearts. And so, Jesus would say, “They treat Me as a dead object”. 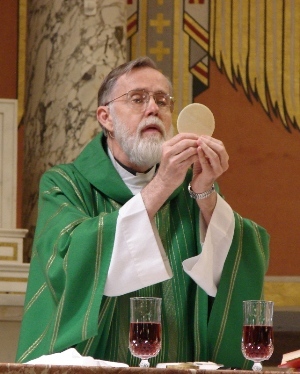 He is alive and He feeds us with His Word and with Himself in the Eucharist and He is treated by many like He does not exist. I know about your behaviour: how you are reputed to be alive and yet are dead. Wake up; put some resolve into what little vigour you have left: it is dying fast. So far I have failed to notice anything in your behaviour that my God could possibly call perfect; remember how you first heard the message. Hold on to that. Repent! If you do not wake up, I shall come to you like a thief, and you will have no idea at what hour I shall come upon you. There are a few in Sardis, it is true, who have kept their robes unstained, and they are fit to come with me, dressed in white. 4. I will be their refuge during life and above all in death. 5. I will bestow a large blessing on all their undertakings. 11. Those who promote this devotion shall have their names written in My Heart, never to be blotted out. 12. I promise you in the excessive mercy of My Heart that My all-powerful love will grant to all those who communicate on the first Friday in nine consecutive months the grace of final penitence; they shall not die in My disgrace nor without receiving their sacraments; My divine Heart shall be their safe refuge in this last moment. R. Those who promote this devotion to the Sacred Heart of Jesus shall have their names written in His Heart never to be blotted out. And then He says in the Revelation.